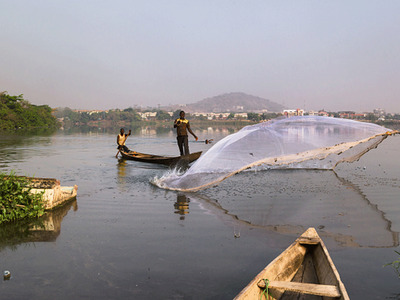 Getty Images/ Irene Becker / ContributorA fisherman casting net from his boat. Jabi Lake in Abuja FCT, Nigeria. Nigeria is finally going to do the painful thing everyone said it has to do. The central bank announced on Wednesday that the naira peg will be abandoned on Monday, June 20, and the currency will be allowed to float freely. “Over the long-run, a weaker currency will help Nigeria’s economy by encouraging import substitution and attracting foreign investors, who have shunned the country for fear of a devaluation,” wrote Capital Economics’ Africa economist John Ashbourne in a note. “But the move will be painful over the short term. Higher import prices will add to inflation, which reached 15.6% y/y in April. This will probably force the authorities to tighten monetary policy,” he added. Analysts have long been arguing that Nigeria will eventually have to capitulate and devalue its currency given that the government’s controversial agenda of currency and price controls created a bunch of economic stresses in Africa’s largest economy. Most recently, inflation soared to a six-year high, which analysts argued underscored the failure of the current FX system to keep inflation under control. Still, devaluing the currency peg will not magically fix all of Nigeria’s problems. The country continues to suffer from numerous headaches, including lower oil prices, the fuel-shortage crisis, and ongoing oil-production disruptions by the Niger Delta Avengers. Plus, the Nigerian Bureau of Statistics recently revealed that the country’s economy shrank by 0.4% year-over-year in the first quarter, which was way worse than expected. “A weaker currency is, at best, a necessary but insufficient condition of an economic recovery,” concluded Ashbourne. But at least it’s a step in the right direction.